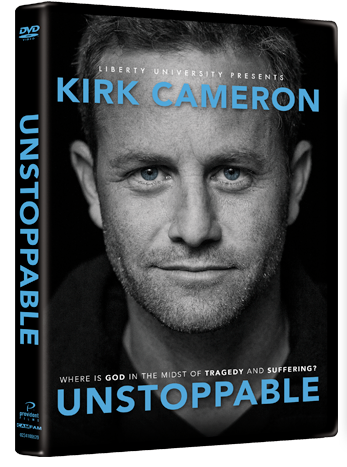 Kirk Cameron's DVD Unstoppable is a newly released DVD that discusses the question "Where is God in the midst of tragedy and suffering?" The DVD begins with Kirk telling the story of a 15 year old family friend who passed away recently. Then Kirk talks about mankind's first experiences with sin and suffering. Stories from the Bible that are touched on include: creation, Adam and Eve, Cain and Abel, the flood, the tower of Babel and Abraham. What I liked least about the movie is the artistic license that was taken with the story of Adam and Eve. First, the graphic image of the rib being removed from Adam was over the top in my opinion. Second, the serpent was depicted as a man with a skin condition. And third, when Adam and Eve are hiding from God, Adam turns and growls -- presumably at God who is about to find him. I always thought that God supernaturally removed Adam's rib with no surgery required and no blood as a byproduct (this was pre-fall after all). I always pictured the serpent as... well... a serpent (but with legs). And my understanding is that Adam was afraid and ashamed -- not angry. These three issues alone are enough that I would not want to show this movie to my children or to unsaved friends of family. There are some music choices (heavy metal/dissonant style) that I didn't love, but I'm sure someone else may think they're great. What I liked most of all is the metaphor of the rainbow as a bow (a weapon) in the sky. Kirk was suggesting that the bow points up into the sky referring to the day on the cross when God's judgement and wrath would come to Him instead of to mankind. Another thought provoking part of the DVD is God's promise to Adam and Eve that one of Eve's descendants would crush the serpent's head and how this was fulfilled in Christ's death and resurrection. Jesus was able to protect His bride (the church) in a way that Adam hadn't. The song "The Time is Now" by Warren Barfield was a highlight of the DVD. And, of course, the moral of the DVD is something that I agree with -- God continually demonstrates his love and mercy for mankind. I'm not sure who the intended audience is for the DVD, but I would suggest it only for adult Christians who are firm enough in their faith that they can overlook the artistic licenses taken. Check Out Unstoppable on Twitter and Facebook. Buy It: You can buy Unstoppable via the official website. Win It: One Sowing Dandelion Seeds reader will win a copy of the DVD Unstoppable! Disclosure (in accordance with the FTC's 16 CFR, Part 255 "Guides Concerning the Use of Endorsements and Testimonials in Advertising): Many thanks to Propeller Consulting, LLC for providing this prize for the giveaway. Choice of winners and opinions are 100% my own and NOT influenced by monetary compensation. I did receive a sample of the product in exchange for this review and post. Only one entrant per mailing address, per giveaway. If you have won the same prize on another blog, you are not eligible to win it again. Winner is subject to eligibility verification. I love Jonah and the Whale story in the old testament!! I like Noah's Ark because it shows how God has mercy on those who follow him. Noah's ark because its a story the kids love! Noah's Ark because it's good for all ages. I appreciated the story of Daniel and the Lion's Den because I like the idea of believing what's right and in your heart and not letting anything take that away is a good lesson. Daniel and the lions' den. I liked it when I was little because my name was Danielle! Love the story of Noah and the Ark. What faith he had to have to do such a task. Noah's and the Ark is definitely my favorite. Although I have going to church since I was a Little Tike. I remember looking at a book with pictures about Noah and The Ark. The Book was in both my Doctor and Dentist Office. With the picture illustrations and (with the help of my Mom) showing how and why Noah and his family constructed the ark and why. The pictures of the animals getting on the Ark were fantastic. I had non-stop questions for my Mom. One of the Best Stories in the Testament. I don't really have a favorite. I find value in bits of all of them. Hannah praying for a son. I love the story of Esther! hmm...this is a toughie but i love the day of pentecost. I love to hear it because it reminds me of God's love for us. I love the beginning of the world story in Genesis. Jonah and Ruth have always been my favorite two stories. Abraham and Issac. I love Abraham's faith and trust in God, how he is willing to sacrifice his own son for God and how god provides the sacrifice. So many great stories. I like the stories of David...he did so much bad and good and still he was considered a man after God's heart. I think this shows the depth of God's grace. I love the story of David and Goliath. It always made me feel more confident as a child. I definitely enjoy Noah's Ark because both children and adults can visualize the power of God! Thanks so much for the chances to win. I love the stories of Ruth and Esther...reminds me that even though I'm an ordinary woman like they were, God can still use me! Not sure I have a favorite. I like seeing the thread of God's love throughout the whole Bible. Thanks for this giveaway! I love the story of Samson! I love the story of Esther so much always been my fav!! I love the story of Ruth because I love the love between her and Boaz. I like many, Daniel is a fave showing of relying on God. I love the story of Ruth and Naomi because it tells of loyalty to others and to God. David and Goliath...God uses the smallest of people/things to accomplish His will. I love the story of Noah and the Ark. A very strong story of faith and hope. I like the story of Ruth and Boaz because I've always enjoyed a good love story. I love the story of Esther...it shows the power of women in the Bible. I like the story of Adam and Eve. It reminds me that temptation is all around us. My favorite story has always been King Solomon deciding the fate of the little baby. Such a beautiful story of love.